When the heater is heating the red light is on. When the heater is not heating the red light is off. The Fluval M Submersible Aquarium Heaterâ€™s quality manufacturing utilizes superior components and construction. The Fluval M 150 Watts Electronic Heater is ideal for use in aquariums up to 45 gallons and has a temperature range of 66-86 degrees Fahrenheit. This sleek, compact heater can be trusted for exceptional performance and unsurpassed reliability. 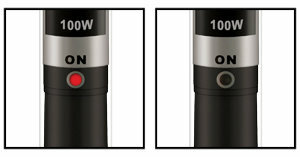 Unique only to the Fluval "M" series the reflective technology equipped in the Fluval M Submersible Aquarium Heater helps maintain the aquariums' natural look as the heater reflects the colors of the surroundings. 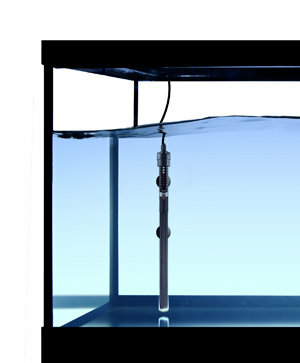 The Fluval M Submersible Aquarium Heaterâ€™s quality manufacturing utilizes superior components and construction. The Fluval M 50 Watts Electronic Heater is ideal for use in aquariums up to 15 gallons and has a temperature range of 66-86 degrees Fahrenheit. This sleek, compact heater can be trusted for exceptional performance and unsurpassed reliability. Unique only to the Fluval "M" series the reflective technology equipped in the Fluval M Submersible Aquarium Heater helps maintain the aquariums' natural look as the heater reflects the colors of the surroundings. The Fluval M Submersible Aquarium Heaterâ€™s quality manufacturing utilizes superior components and construction. The Fluval M 200 Watts Electronic Heater is ideal for use in aquariums up to 65 gallons and has a temperature range of 66-86 degrees Fahrenheit. This sleek, compact heater can be trusted for exceptional performance and unsurpassed reliability. Unique only to the Fluval "M" series the reflective technology equipped in the Fluval M Submersible Aquarium Heater helps maintain the aquariums' natural look as the heater reflects the colors of the surroundings.The heater is fully submersible and safe to operate fully submersible. About Zoo Medical LabratoriesZoo Med is the number one company for reptile products worldwide. They introduced the first American reptile vitamin in 1982 and today hold 8 reptile product patents and 9 aquatic product patents in the USA and internationally with more pending.Â Zoo Med invented UVB lighting for reptiles, back in 1993 and which since has become the standard worldwide for Zoos, Veterinarians and the reptile hobbyist. A wide variety of products make up the Zoo Med family including quality products for reptiles, amphibians, fish and birds. An ideal 24 hour primary or secondary heat source. Perfect for tropical or temperate reptilian species. Contain a solid state nichrome heating element. Forming a solid bond for optimum heat transfer. Available in a variety of sizes. ETH Heaters are the first external heaters for aquariums with the exclusive PTC technology. The self-limiting PTC heating element guarantees maximum safety against any risk of overheating. Designed to be used on return lines coming from canister filters or sumps. Top Level Categories for ViaAqua 300-Watt Quartz Glass Submersible Heater with Built-In Thermostat.